This is a recreational area in a small block of forest above Karori Park. The area is situated between Makara Peak and Western Hills, so often forms part of a circuit through those areas â€“ particularly via the Wahine and 98 Downhill tracks, plus entry/exit via Karori Park Loop. During 2008 and 2009 the Karori Park Beginners' Trail Project worked to add and upgrade tracks in this area. This work included clearing and realigning the 98 Downhill track (which had been blocked by fallen trees) and construction of The Snake and Karori Pump tracks for beginners. 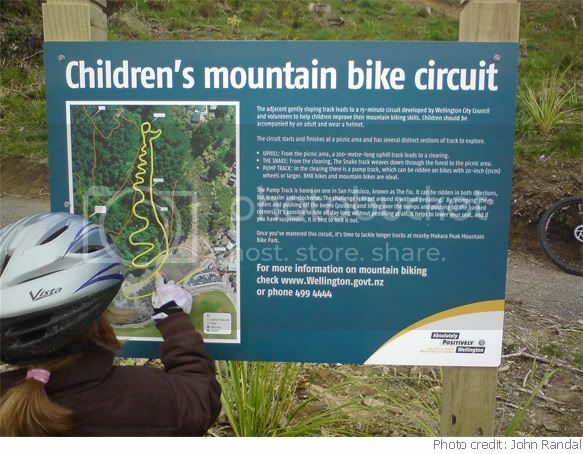 The adjacent gently sloping track leads to a 15-minute circuit developed by Wellington City Council and volunteers to help children improve their mountain bike skills. Children should be accompanied by an adult and wear a helmet. The circuit starts and finishes at a picnic area and has several distinct sections of track to explore. UPHILL: From the picnic area, a 200-metre-long uphill track leads to a clearing. THE SNAKE: From the clearing, The Snake track weaves down through the forest to the picnic area. PUMP TRACK: In the clearing there is a pump track, which can be ridden on bikes with 20-inch (51cm) wheels or larger. BMX bikes and mountain bikes are ideal. The Pump Track is based on one in San Francisco, known as The Fix. It can be ridden in both directions, but is easier anti-clockwise. The challenge is to get around it without pedalling. By 'pumping' the rollers and pushing off the berms (pushing and lifting over the bumps and pushing off the banked corners), it's possible to ride all day long without pedalling at all. It helps to lower your seat, and if you have suspension, it is best to lock it out. Once you've mastered this circuit, it's time to tackle longer tracks at nearby Makara Peak Mountain Bike Park.